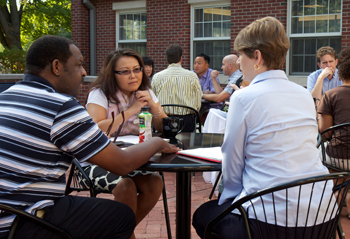 The Wabash Center strengthens theological education by providing a place for teachers of theology and religion to share ideas, reflect on practices and keep pace with a fast-changing environment -- and to relax and have fun. When Whitney Bauman decided to become a religion professor more than a decade ago, he pictured himself giving lectures and leading seminars at a small Christian college or seminary. He did not imagine that he would be teaching at an urban public university, much less one where most of the 50,000 students are non-native English speakers and are among the first in their families to attend college. But that’s where he got his sole job offer: at Florida International University in Miami. And that’s where Bauman, now 37, found himself floundering a few years ago with little training in how to teach and no natural support system to help him learn. 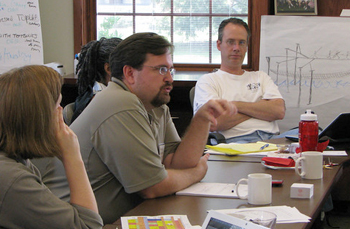 Help came in the form of a peer-to-peer workshop, offered by the Wabash Center for Teaching and Learning in Theology and Religion in Crawfordsville, Ind. There Bauman built a durable network of colleagues in a relaxed setting, free from the all-too-familiar pressures to outperform and impress at every turn. In the process, he became a confident experimenter and a more relaxed teacher. More than 1,000 religion faculty members have gone through Wabash’s workshops since the center was founded at Wabash College in 1996 with funding from the Indianapolis-based Lilly Endowment Inc. Currently, for each cohort’s 14 participants, it involves a summer week in Indiana at Wabash, then a winter weekend retreat on Texas’ Mustang Island, followed by a final summer week in Indiana. Getting into a workshop is an accomplishment in itself. For pre-tenure workshops, applications outnumber available slots by 5 to 1. Like coaches assembling a team, Wabash staffers carefully consider chemistry and choose individuals who will likely work best as a group. The result is a social environment where a learning community can emerge around the quest to teach religion and theology well. The Wabash Center aims to help those who teach tomorrow’s faith leaders -- both ordained and lay -- be as effective as possible. The process isn’t about imparting quick fixes. It’s about enabling educators to discern their current vocations, analyze the needs of their scholastic environments and design course assignments to meet specific objectives -- even in a time when goals are changing fast. Much has changed in theological education over a generation, and faculty young and old must constantly adapt to the unexpected. As institutions ask them to teach more and more students online, for instance, some professors feel disenfranchised of their dreams to forge face-to-face relationships or to be a charismatic, sage presence on campus, according to Wabash Center Associate Director Paul Myhre. 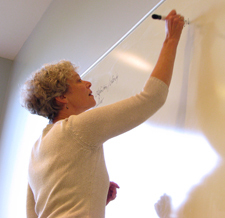 Competition for religion teaching jobs is so fierce that those fortunate enough to get hired have largely forgotten how to be collegial, said Patricia O’Connell Killen, the academic vice president at Gonzaga University, who has led eight Wabash workshops. They’re habituated to focus myopically on their research and personal ambitions, she said, yet teachers must collaborate if they’re to improve in their craft. Wabash workshops give them that opportunity. What’s more, Killen added, religion scholars face unique pressures to continually justify their jobs at institutions that often are either struggling to survive or cutting back on religion departments. And a rapidly changing church landscape means faculty get bombarded with mixed messages about how best to train tomorrow’s faith leaders. “What is the church you are preparing them for?” is a question that comes up often at Wabash workshops, according to Wabash Center Associate Director Tom Pearson. With so much pressure and change afoot in their professional lives, religion educators welcome a chance to get away, work through exercises that compare pedagogies -- and play. Sessions allocate time for recreation, whether it’s canoeing, badminton or jogging as a group on a Texas beach. Such activities help teachers relax, Myhre and Pearson said, and rekindle passion for teaching, even if it’s not in the forms or settings they once anticipated. Wabash workshops include relaxation and fun. As workshops unfold, participants think a lot about alignment. They ask which types of assignments advance a course’s goals and which ones don’t. For Associate Professor of Homiletics Debra Mumford, asking that question, both in workshop sessions and back at Louisville Presbyterian Theological Seminary, led her to stop having “Introduction to Preaching” students read a history of the craft. A similar process brought Florida International’s Bauman to think critically about when to assign reading and when to assign something else. In one course, for example, he was hoping that students would rethink their consumption habits in light of heightened environmental awareness and religious values. Reading alone wasn’t getting the job done, he found, so he swapped out some reading for online exercises. Those have made a bigger impression. In Mumford’s classes at Louisville Seminary, preachers of tomorrow are no longer merely told how a good sermon comes together, as they were before Mumford’s Wabash experience. Now they see more examples of how it happens, both in YouTube videos and on campus. Mumford has started letting students watch her process as she exegetes a text and otherwise prepares to preach in the school’s chapel. Students then attend the service and see how elements in her preparation bear fruit in the holy assembly. Sometimes lessons learned at Wabash shape perspectives as much as classroom techniques. David Garber, associate professor of Old Testament and Hebrew at Mercer University’s McAfee School of Theology, has watched his institution’s student body evolve from about 25 percent African-American to 50 percent over the past eight years. In revising his syllabi over time, he realized he needed different insights than what his older white colleagues could provide. He found those in a Wabash workshop where he was one of only two white men. Several in the group were African-Americans and Korean-Americans. Since then, Garber has made adjustments to suit his school’s student body, which is ever-more diverse, not only in racial terms but also theologically and in terms of age. He now assigns readings written by African-Americans, Latinas and others who represent a diversity of backgrounds. He also works with white students to consider how their perspectives on biblical texts can reflect their privileged status in American society. Those who’ve done Wabash workshops are now leaving fingerprints on their institutions. At the Lutheran Theological Seminary at Philadelphia (LTSP) and Luther Seminary in St. Paul, Minn., alumni of Wabash workshops have played key roles in recent overhauls of their respective schools’ curricula, according to deans at both schools. They’ve led colleagues to interpret their settings with fresh eyes, to ascertain how today’s goals differ in some ways from yesterday’s, and to develop curricula that align with current needs. Results have been bold. At LTSP, students had said they needed more flexibility to take courses whenever they could find time among competing work and family responsibilities. Hence, this year, for the first time, students have no prerequisites for any of their courses. It’s part of a radical redesign that moved forward in large measure because Wabash-coached faculty kept their eyes on the endgame and dared to try it. Take-aways from Wabash trickle down to students, many of whom are apt to play active roles in congregations or denominations over their lifetimes. If those at Florida International absorb what Bauman is trying to share, for instance, they’ll learn how to put together and manage their own learning communities -- not only in college, but in religious life as well. Perhaps the Wabash influence that endures longest is the network the participants create. Workshop cohorts reunite once a year, usually over dinner at the annual American Academy of Religion conference. 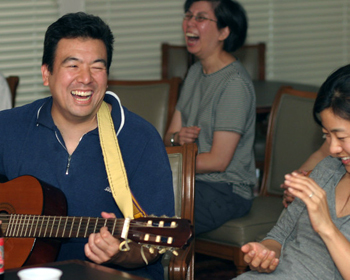 Between reunions, participants stay in touch around their teaching triumphs and challenges. Such collegial habits will always pay dividends and never become obsolete, Wabash leaders say, no matter how much their field might change in years to come. How is the changing profile of your audience affecting how you deliver services? Who helps you and your colleagues make these adjustments? To whom do you turn to refine the craft of your ministry? What do you do to nurture those relationships? Multiple dynamics of a profession and an institution often reinforce tendencies to be “self-oriented.” What is needed to counteract such forces? Reframing and re-creating work requires emotional, physical and spiritual space to explore. Who invites you to such spaces? What is required to accept the invitation? Teachers are on the front line of educational institutions. Wabash invests in nurturing their vocations and over time this investment affects the institution. Who is on the front lines of your institution and how do you invest in those people’s vocations? Barak Richman and Daniel Libenson: What is the role of the 21st-century rabbi?